Diners, Drive-Ins and Dives is Right! On my last trip to Pittsburgh, MAD2Go had the chance to stop in at Kelly O’s Diner in Pittsburgh. I must admit I’ve always been a bit suspicious of restaurants featured on TV shows. Even if they were good prior to filming, they are often victims of their own success as viewers mob well-rated venues. 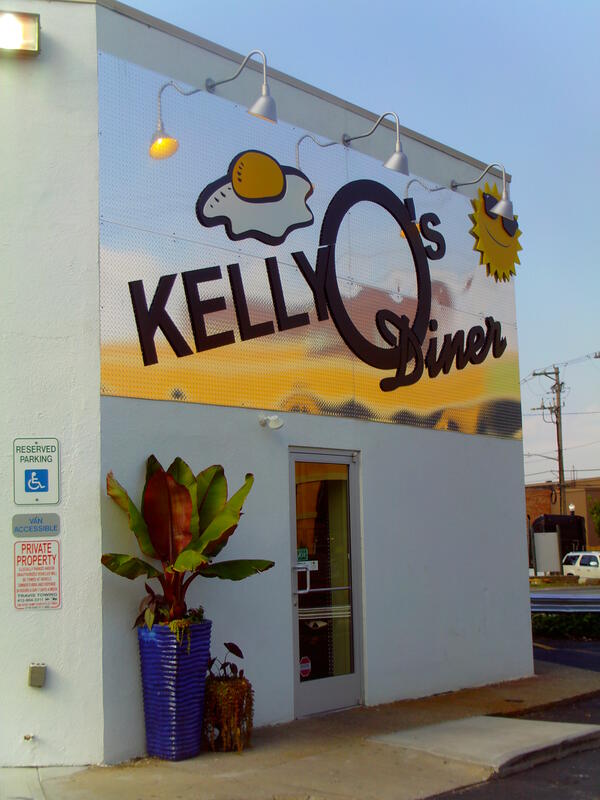 I was pleasantly surprised by the meal I had at Kelly O’s after it was showcased on Triple D. I visited the downtown location, which featured a vibrant nouveau-retro décor. I particularly wanted to try the haluski, which I had never seen on a menu. Apparently it’s a church fair staple in Pittsburgh, since the city has a large population descended from Eastern European immigrants. 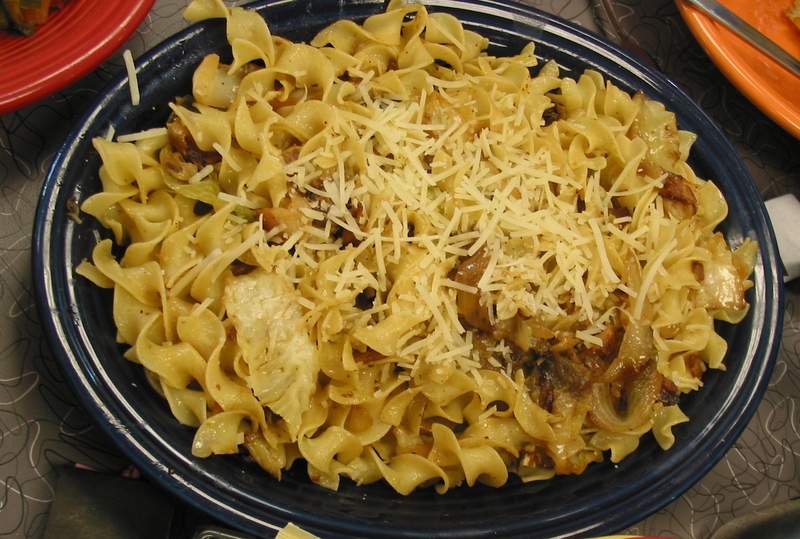 Haluski is Slovak Soul food; a dish I have made and enjoyed many times. Its three main ingredients are cabbage, noodles, and onions. When I was young, my mother used to make the noodles, but like most people she now uses store bought. I don’t have a written copy of the recipe, because every Slovak woman had her own version and they probably varied depending on the amount of cabbage and onions on hand. In a heavy skillet, brown the onion in butter. When browned, add salt, pepper, paprika and cabbage. Cover and simmer about 5 minutes. Add a little water or broth as needed; cook until cabbage is tender. My Mother usually served it over good quality egg noodles. Kelly O’s adds a couple of twists to their version of haluski—they top theirs with bacon and a dusting of shredded cheese. While I loved the addition of the bacon, at first it seemed a little strange. Then I remembered early cooking lessons with my Mom. Back in the day, she saved the bacon fat from the skillet and poured it into a clean glass jar. Instead of using shorting or butter when pan frying, she would use a scoop of bacon fat. It was obviously not heart healthy, but the fat added a tremendous amount of flavor. There is a good chance a made haluski with bacon fat at some point. Categories: Pennsylvania, Pittsburgh | Tags: Bacon, Bacon fat, Diners, Diners Drive-ins and Dives, Haluski, Halusky, Halusky recipe, Kelly O’s, Mid Atlantic, Mid Atlantic Travel, Pennsylvania, Photographs, Pittsburgh, Pittsburgh Diners, Restaurants, Travel, travel photographs | Permalink. Click on image to go to our video tour of the animated wood carving. Tom and I visited the Slovak Folk Crafts Shop after our recent trip to Pittsburgh. We were surprised and delighted to see the largest animated wood carving in the United States. The Jednota published my story on page 17 of the February 13, 2013 edition of the Jednota. Click on the image above to go to our video collage of the wood carving. Categories: Pennsylvania | Tags: " Master Jozef Pekara, "Slovensky Bethlehem, 1605 S. Center St. Grove City PA, animated wood carving, basswood, Dave Dayton, Folk Art, Gove City, linden, Mid Atlantic Region, Miloš Karabin, national tree of Slovakia, nativity scene, Pennsylvania, Rajecká Lesná, Slovak, Slovak Crafts, Slovak Cuvac, Slovak Folk Art, Slovak Folk Crafts Shoppe, Slovak Wood Carving, Slovakia, Tatras, Travel, travel photographs, travel video, video, Vladimir Tomko, wood carvers, wood carving, wood carvings, www.SlovakFolkCrafts.com. | Permalink. 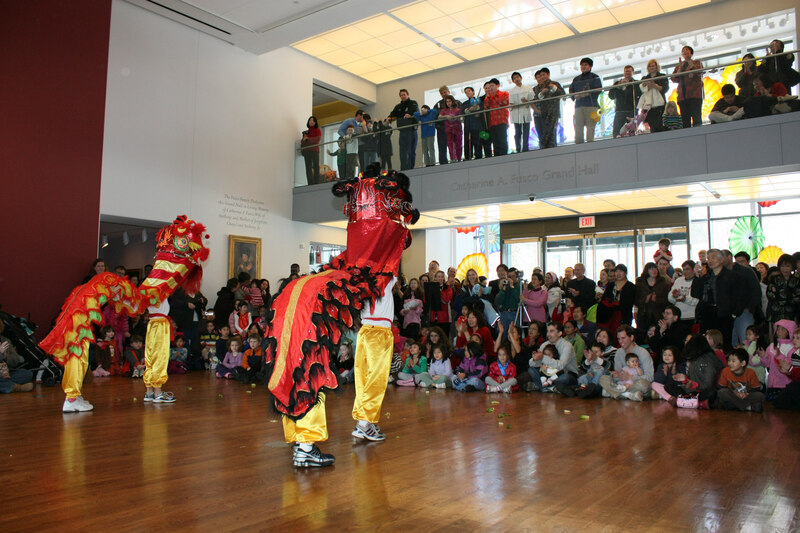 The Delaware Art Museum is pleased to welcome the seventh annual Chinese New Year Celebration on Saturday, February 16. Presented in conjunction with Hanlin Chinese Culture Association, this festive, free celebration includes traditional Chinese art activities, artist demonstrations, a dragon art scavenger hunt, a dragon dance and Chinese yo-yo performance by the Chinese American Community Center Dance Troupe and Yo-Yo Club, and a special musical performance by Taiwanese Music Ensemble of New York. Artwork created by children from the Chinese School of Delaware to commemorate this holiday will also be on view. There is no Museum admission during Chinese New Year and all galleries will be open throughout the day from 10:00 a.m. – 4:00 p.m. Categories: Delaware, Wilmington | Tags: Chinese American Community Center Dance Troupe and Yo-Yo Club, Chinese art activities, Chinese New Year Celebration, Chinese School of Delaware, Delaware, Delaware Art Museum, Hanlin Chinese Culture Association, Mid Atlantic Region, Mid Atlantic Travel, Taiwanese Music Ensemble of New York, Travel, Wilmington | Permalink. Okay, I admit I’m not fond of the dark. I’ve never been fond of the dark. Things with big scary teeth live in the dark. The Calvert Marine Museum (CMM) proves this for all time by letting guests “sleep” beneath the jaws of a giant Megalodon Shark. That’s pretty much guaranteed to give me exciting dreams! Designed for groups of 10 to 20 participants, a CMM overnight invites guests to experience the museum after hours and behind the scenes. The adventure begins Saturday nights, when guests enjoy as pizza dinner, a special program, behind-the-scenes activities, a movie, and a continental breakfast. Admission to the museum is included, so you can tour the exhibits during normal visiting hours on Saturday prior to the 5:00 p.m. check-in. The overnight ends Sunday morning after breakfast. Overnight adventures are a unique treat for special birthdays, scout troops, church youth groups, or anyone who is looking for a great way to build camaraderie while learning about the area’s cultural and natural history. 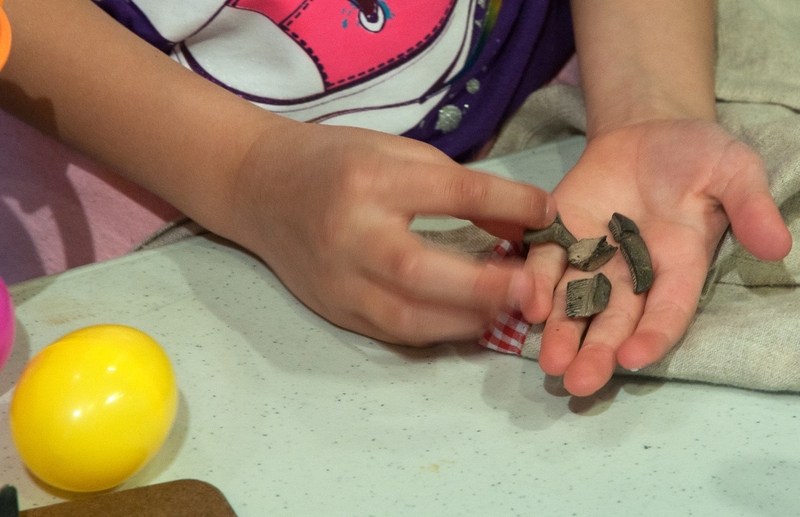 Museum educators are happy to craft a program that best meets your group’s interests and needs. Girl Scout groups can even earn special interest badges. 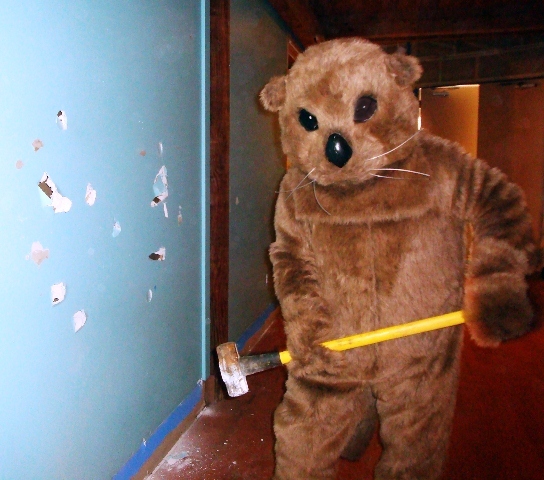 To schedule a museum overnight, call 410-326-2042 ext. 41 to reserve your date. The Group Services Coordinator will work with you to ensure your overnight experience at the Calvert Marine Museum is exactly what you are looking for. There is a non-refundable $25 program fee due upon booking. For open dates and theme ideas, visit the website. 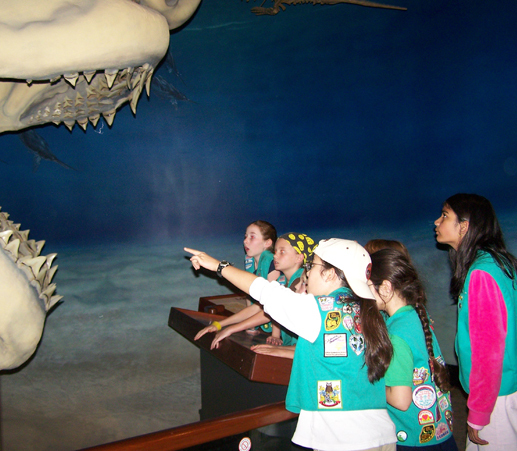 Categories: Children's Travel, Maryland | Tags: Adventure Travel, Calvert Marine Museum, group adventures, group overnight, kids’ overnight adventures, Maryland, Megalodon Shark, Mid Atlantic States, Mid Atlantic Travel, museum overnight, Shark, Shark overnight, sleep beneath shark, Travel | Permalink. Those looking for light bite to start the day should check out the Thronson Café in the Delaware Museum of Art. The café and its terrace both overlook the Copeland Sculpture Garden. Assorted coffees, muffins, bagels, juices and the popular fruit parfait provide the perfect art beak in a busy day. The Thronson Café is open Wednesday though Saturday, 11:00 a.m. to 3:00 p.m., and Sunday noon to 3:00 p.m. The Delaware Art Museum’s collections are predominantly drawn from late 19th and early 20th century American illustration, as well as works from the Pre-Raphaelite Brotherhood. The basis of the museum’s collections is the works of Howard Pyle and his pupils, N.C. Wyeth, Frank Schoonover, and Stanley Arthurs. Starting in 1961 Helen Farr Sloan, the wife of artist John French Sloan, began donations that eventually totaled 5,000 objects. Since the 1970s the museum has added works by modern artists, such as Jacob Lawrence, Louise Nevelson, Robert Motherwell, George Segal and Jim Dine. Categories: Delaware, Wilmington | Tags: Breakfast, Brunch, Copeland Sculpture Garden, Delaware, Delaware Art Museum, Mid Atlantic Region, Museum Restaurants, Thronson Café, Travel, Wilmington | Permalink.